"Garlic bread is always great with pasta! 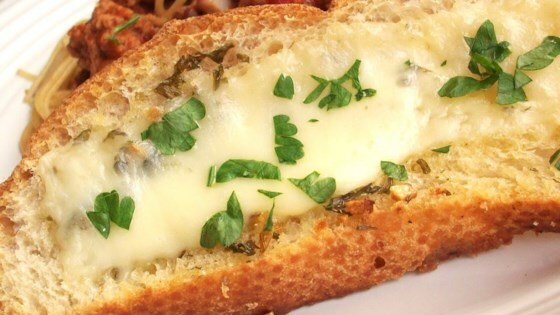 This cheese-covered garlic bread is ready in minutes." In a small saucepan over medium heat, melt butter and mix with garlic powder and dried parsley. A great, grand and wonderfully easy recipe for toasty garlic bread. This is by FAR the best garlic bread EVER!!! So good and SOOOO easy. I serve it with a dish of balsamic vinagar and olive oil. It gets more attention and complements then the main course! Mon Dui! Wonderful stuff, the presentation is great too--it looks like I spent quite a bit of time on this side dish. I agree w/ prior reviews: use fresh garlic.